The entire contents of the Harvard-Yenching Library’s Chinese rare book collection, 51,500 volumes in all, will be digitized over the next six years by Harvard librarians with funds from the National Library of China. 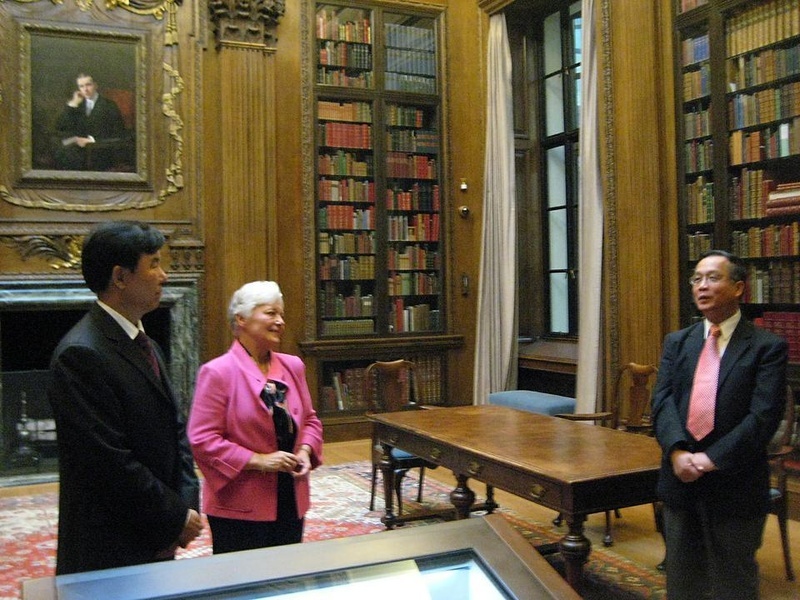 The Harvard-Yenching Library—the largest university library for East Asian research in the Western World—signed an agreement on Friday with the National Library of China to digitize Harvard’s entire 51,500-volume Chinese rare book collection over the next six years. The digitization work, which will be funded by the NLC but conducted by Harvard librarians, will also allow all of the items in the collection to be examined for damage and treated for conservation if necessary. Harvard and NLC representatives declined to disclose the project’s exact price tag but said that it would cost millions of dollars. Nancy M. Cline, chief librarian of Harvard College Library, said at the signing ceremony in Widener Library that the project would help preserve rare and aging items in the collection and allow scholars from around the world to access the materials for free. The first three-year phase of the project will begin in January and digitize books from the Song, Yuan, and Ming dynasties, which date from about 960 AD to 1644. The second phase will begin in 2013 and digitize Qing Dynasty books that date from 1644 to 1795. Furui Zhan, director of the NLC, said at the ceremony that a preliminary survey indicated that more than a third of the titles in Harvard’s collection were not available at the NLC, and that others are different editions of existing books. “The National Library is very ambitious, so we hope that through this project we can continue to get more funding from the Chinese government to do digitization projects,” Zhan said in Mandarin through a translator at the event. The NLC, which recently celebrated its 100th anniversary, holds over 26 million volumes and is the third largest national library in the world, Cline noted. Among the most notable items in Harvard’s collection are two volumes of the Yongle Dadian, a 15th century Chinese encyclopedia that once comprised thousands of volumes, or over 20,000 chapters, but has since been almost entirely scattered, lost, or destroyed. Wilt Idema, chair of the Department of East Asian Languages and Civilizations, noted that the Encyclopedia was intended as “a complete compendium of human knowledge” at the time. Idema said that the digitization of Harvard’s collection would “level the playing field” for researchers around the world. “It’s an extremely valuable collection, and that’s recognized by the fact that it’s the Chinese National Library that’s basically putting up the money,” Idema said. —Staff writer Peter F. Zhu can be reached at pzhu@fas.harvard.edu. The original version of the Oct. 13 news article "Harvard College Library, China Form Pact" incorrectly stated that China's Qing Dynasty stretched from 1644 to 1795. In fact, some of the Qing Dynasty books to be digitized were from that period, but the Dynasty itself lasted until the early 20th century.